Dec. 17, 2017: International Space Station Configuration. 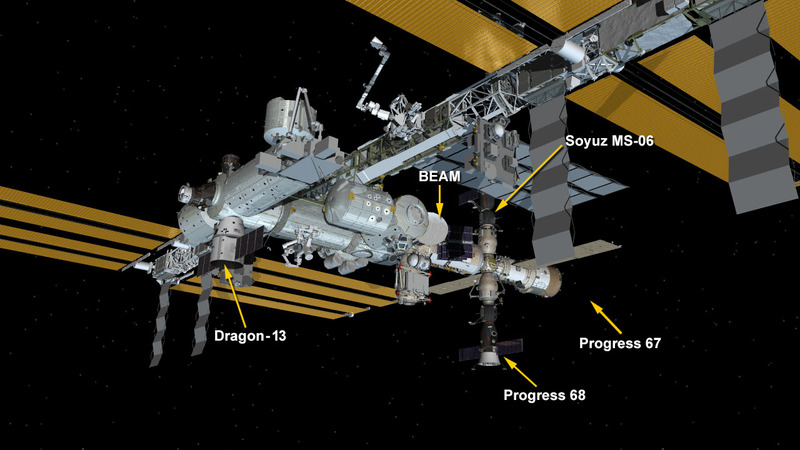 Four spaceships are parked at the space station including the SpaceX Dragon space freighter, the Progress 67 and 68 resupply ships and the Soyuz MS-06 crew ship. The SpaceX Dragon cargo spacecraft was installed on the Harmony module of the International Space Station at 8:26 a.m. EST. The 13th contracted commercial resupply mission from SpaceX (CRS-13) delivered more than 4,800 pounds of supplies and payloads to the station. Among the research materials flying inside Dragon’s pressurized area, one investigation will demonstrate the benefits of manufacturing fiber optic filaments in a microgravity environment. Designed by the company Made in Space, and sponsored by the Center for the Advancement of Science in Space (CASIS), the investigation will attempt to pull fiber optic wire from ZBLAN, a heavy metal fluoride glass commonly used to make fiber optic glass. Results from this investigation could lead to the production of higher-quality fiber optic products for use in space and on Earth. Dragon is scheduled to depart the station in January 2018 and return to Earth with more than 3,600 pounds of research, hardware and crew supplies. Expedition 54-55 Flight Engineers Scott Tingle of NASA, Anton Shkaplerov of Roscosmos and Norishige Kanai of the Japan Aerospace Exploration Agency are on their way to the space station after a launch earlier today from the Baikonur Cosmodrome in Kazakhstan at 2:21 a.m. EST Sunday, Dec. 17 (1:21 p.m. Baikonur time). The trio will orbit the Earth for approximately two days before docking to the space station’s Rassvet module, at 3:43 a.m. on Tuesday, Dec. 19. NASA TV coverage of the docking will begin at 3 a.m. Tuesday. For more information about the mission, visit: https://blogs.nasa.gov/spacestation/. autres missions puisse apporter un plus pour l’humanité. Je suis personellement très fier de votre travail. Puisse la NASA faire plus de publicité sur les résultats de ces recherches. Very interesting, as usual. Thank You. I’m almost finished reading Scott Kelley’s book, “Endurance” and it is great to be able to follow the result missions and to recognize some of the names. Happy Holidays to all of you on the ISS! Merry Christmas to all crew on the ISS.